"The songs are very joyful and have these sing-along parts – they stick with people"
Any time that a band comes out of nowhere and scores a worldwide smash with their debut album, it's a big, big deal. But when that group hails from Iceland, has six members and a sound that incorporates such instruments as a trumpet and accordion, it's something of a game-changer. 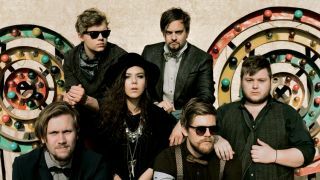 Such is the case with Of Monsters And Men, the celebratory sextet that includes Nanna Bryndis Hilmarsdottir (vocals, guitar), Ragnar "Raggi" Porhallsson (vocals, guitar), Brynjar Leiffson (guitar), Arnar Rosenkranz Hilmarsson (drums), Arni Guojonsson (piano, accordion) and Kristjan Pall Kristjansson (bass), who hit the top of the charts with the song Little Talks from their Top 10 album, My Head Is An Animal. "We've got acoustic guitars and arena-sounding drums, dramatic pianos and reverb-y guitars," says guitarist Leiffson. "That's how I describe the sound of the band. There's a lot going on at once." One of 2012's brightest success stories, Of Monsters And Men recently embarked on a sold-out tour of the US. While the group was in New York City, MusicRadar sat down with Leiffson to talk about how a bunch of Icelanders has managed to make everybody stand up and take notice. How did you come to join Of Monsters And Men? Did the band do a lot of gigging before the album came out? It seems as if things happened pretty quickly for you. "Probably not a lot of gigs, or not as much as other bands. I think we did a good amount of shows from December 2011 until February of this year. We've only done two or three shows in Iceland this year, which is kind of funny." Is it hard for bands to get noticed in Iceland? "To get big crowds, you just have to play a lot of shows, and eventually people will find out about you. It's kind of tricky, I guess. Not everybody can build an audience. But there's bars and clubs, and people always want to hear music when they go out." What's the music scene like in Iceland? Are there particular genres that are more popular than others right now? "I'm not sure. There's some good bands, and they're all really diverse. I've been told that a lot of the bands on the radio are doing kind of indie music. Everybody seems to be doing their own thing. We're not part of any scene or something. There's folk acts in Iceland, but nobody has the anthemic sound that we have. Most of them are pretty lo-fi. I like them, but we're not like them at all." "Right now, venues are being torn down. When everything was doing well with the economy, before the banking crisis, some people had this great idea to build a huge music hall. So now that we have this big place, there's this thinking going around that the bars and clubs should close down, because we have the giant music hall, you know? Personally, I love going to bars and small places and checking out lots of bands." What do you think it is about the group and the album that's connecting with people? "Hmm, I don't know. The songs are very joyful and have these sing-along parts - they stick with people. They get in people's heads and make them want to participate. That helps, I'm sure. Also, we try to get everybody involved in what we're doing. We try to bring people into the experience when we perform, so that probably comes across in the music that's on the album. "I have to say, the acceptance from everybody has been amazing. It's almost overwhelming. Here in the US, fans are making us feel really welcome. It's been fantastic to come over and have everybody respond to our music." The band combines elements of Celtic folk, alt-rock, pop and Zydeco, among others. What kinds of records do you guys play for one another? "It's not like we plan things out or go 'Oh, we should try to sound like this' or anything. Our songs just sort of evolve. We don't have discussions in that way. There are common bands we like a lot. The Arcade Fire is a big one - everybody in the band likes them. The Arctic Monkeys, too. I think our music just comes very naturally to us, though." With such a large group, were there special considerations involved with capturing all of the instrumentation in the studio? "Yeah, there are. [Laughs] We didn't do anything special, though. We started out with a simple idea: to make a record where the band played live in one room. We wanted to capture the energy of our live performance. So things started out very simply, but as we went along in the studio, we wanted to add more and more things. Before we knew it, we spent something like three months in the studio overdubbing instruments and adding tracks. We put on lots of backing vocals, guitars and synths. It all snowballed." When tracking the album, did the band stick faithfully to demos? How much freedom does everybody have to flesh things out? "When we went in to record, the songs were already mapped out. There is one song, though, King And Lionheart, that we weren't too sure of; we weren't even going to have it on the album. We recorded it just to see what would happen, not expecting much. It turned out so well that we decided to keep it, and now it's on the record." With so many people and different personalities in the band, is it hard sometimes for everybody to get along? What kind of guitars do you play? "I use a Duesenberg Starplayer TV and a Fender Jaguar. They're both great in their own ways. Last January, we were getting ready to go into the studio to record some songs for the worldwide release of the album. Before that, I walked into this guitar shop and saw the Duesenberg. I'd never seen a guitar like it in my life. I bought it without any clue what I was getting, but I was really surprised. It's sturdy, and it sounds good. Already, I can tell it's going to be very reliable. "The Jaguar is what I used to record the whole album. It has a beautiful kind of punchy, clangy sound that I love. It sounds classic, and I guess it is." There's a lot of touring to be done on this album, but has the group started to think about the follow-up? "Not a lot, no. We're trying to write a little bit and get some ideas. Everybody is in their own separate corners, but hopefully next year, when the touring has calmed down, we'll get in the room and do something good."